Kobe (135.192E 34.676N) is the third port of Japan, after Yokohama and Nagoya. A small fishing village until 1868, when the opening of Japan led to rapid development, Kobe is located near Hyogo, which was the capital of Japan in the 12th century. By 1940 the population was 967,234 persons. In 1941, Kobe was a major naval base and hosted two major shipyards, including the Kawasaki submarine yard. Zuikaku was constructed here. Kobe was also the site of a major locomotive works. The city was attacked by B-29 Superfortresses laden with incendiary bombs on 16 March 1945. 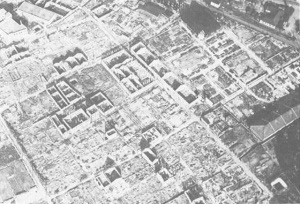 Three square miles (780 hectares) of the city were burned out, killing 8000 and leaving another 650,000 homeless. American losses were three bombers destroyed and eleven damaged, none due to enemy action.